Some hotels claim their proximity to a city’s culture scene and art galleries to attract visitors. But several Dallas hotels have become venues themselves for displaying art. Imagine how being surrounded by beautiful things—from traditionally grand imported artifacts to thoroughly modern works by local artists—creates a different impression of your environment. One of the beauties of the Adolphus Hotel is its longevity. Having been in operation for more than 100 years, it qualifies as a beloved historic landmark in Dallas. For the hotel, art has been a major factor in promoting an elegant experience for multiple generations of guests. Even as the hotel has been updated with modern conveniences, interior designers have aimed to create the hotel of people’s imaginations, one whose luxurious ambience is enhanced with beautiful paintings, chandeliers, and tapestries. 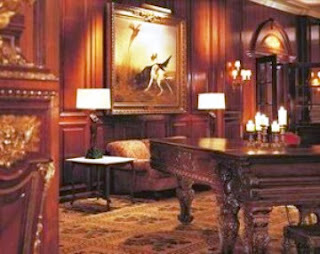 Originally, St. Louis beer baron Adolphus Busch featured his private art collection in the hotel he built. But those contributions have been enhanced with the recent addition of enduring pieces of antique furniture, dateless old-world-style oil paintings, and imported hand-blown Murano crystal chandeliers. “People love to be surrounded by fine things, such as bold Flemish tapestries in the lobby living room,” explains David Davis, Director of Public Relations for the Adolphus. Dating to 1661, the tapestries depict events in the life of Cleopatra. Another striking piece, a chandelier from the 1904 St. Louis World’s Fair bought by Busch, lends a feeling of nostalgia and tranquility to the hotel. displayed in The Joule Hotel. When developer Tim Headington opened The Joule Hotel in Dallas in 2006, he created a large gallery space from which to showcase his private art collection. Every wall in the hotel has some form of art, including favorites by mixed-media artist and photographer Bram Tihany and pieces acquired from John Runyan’s Fine Art gallery in Dallas. New site-specific pieces have been commissioned from Tihany and Anthony Pearson--check out the spa, energy pool, and massage rooms to see samples of their works. A series of 10-feet-tall mosaics representing earth, wind, and fire was rescued from the original Mercantile Bank in Dallas’s historic district. It has been restored and is now a major feature of The Joule, bringing serenity and tranquility to the hotel. Although there is a good mix of styles, the majority of art is contemporary. Using the entire hotel as gallery space, this genre seems to create a happy mood and lifts spirits of guests.